The Canadian Welding Association has seen diminishing numbers of workers entering the trade and the organization is taking steps to entice future workers. For the third year, the organization is hosting welding camps for students at locations throughout the country. This week, 20 Calgary students, selected by their school’s principals and councillors, gathered at Bishop Grandin High School for a lesson in welding. The 14 year olds and 15 year olds received instruction from journeyman welders. Patterson, a red seal journeyman welder with more than 15 years of experience, says the program offers great exposure for teenagers who may want to pursue a hands-on career where they won’t be tied to a desk. “They love it. You can see the smiling faces in here. They’re having a good time learning,” Patterson said as the students honed their math skills, measuring skills, and teamwork. Andrea Benavides, a 15-year-old who will soon begin Grade 10 at Bishop O’Byrne High School, says she has a desire to build something tactile and permanent. Benavides says she’s currently considering a career as a mechanic or and aircraft structures technician and welding would be a valuable tool in her arsenal. Elton Quintero says he never had an opportunity to try welding before this week. The 14-year-old says he appreciates the chance to experience what could become his future livelihood. “This opens up a path to see if you’re interested in taking this in high school, then you can take this as a career,” said Quintero. 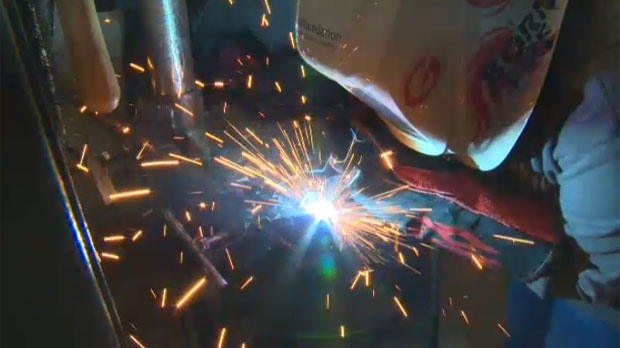 While the welding camps have only been in existence for three years, organizers says some past campers have now enrolled in post-secondary programs to become journeyman welders.